After a brief but interesting dalliance with the Amstrad CPC last time, here’s the fourth instalment in the Code Notes series seeing us returning to both the C64 and the mid 1980s in order to examine something a little different. 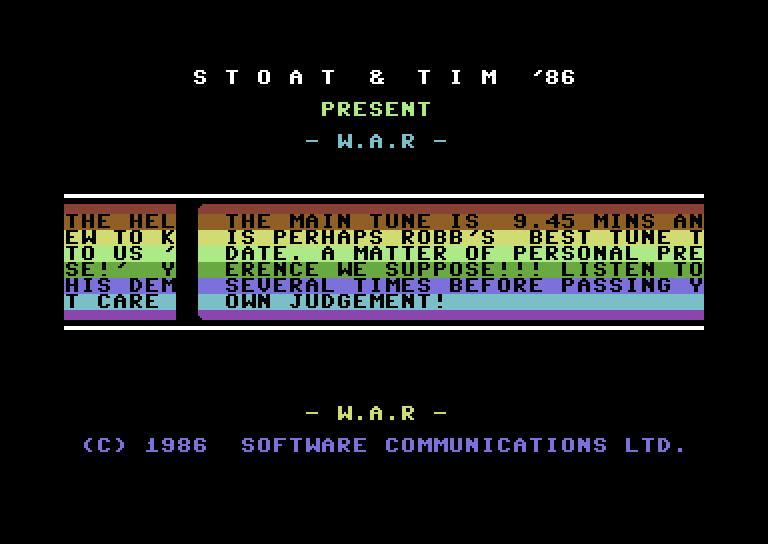 Stoat & Tim were already well established demo developers when they started working on a bi-directional scrolling shoot ‘em up called Ad Infinitum (which exists online in an incomplete form) and, although software publishers Martech took a shine to it, concerns were presumably raised about the similarities to the 1985 Graftgold classic Uridium because changes were made to the game mechanics which sadly dented the playability. The title was also changed to W.A.R. which we can probably assume was to fill a C64-shaped hole in Martech’s catalogue since they published a different, vertical shoot ‘em up with that name on several other 8-bits. But what we’re looking at here is, in essence, an official demo released via the UK online service Compunet in order to promote this new game and showcase the soundtrack written for the game by Rob Hubbard which includes a whopping nine and a half minutes of title tune. The screen is quite sparse with the main focus being the series of messages being delivered via two moving panels in the middle, but the process of refreshing this area is more convoluted than it might initially seem; the text mentions that “24 lines are being masked and scrolled” which presumably means each panel is rendered somewhere to memory before the two are then layered together on the screen. That requires quite a whack of processing time especially if the loops haven’t been unrolled so, although it does look a tad empty outside that main effect, there’s quite a bit actually going on. Even the character set is misleading since it has some subtle tweaks for the corners of the panels and isn’t merely the C64’s default ROM font. Having the panels deliver the text is an interesting twist, but the main “selling point” here really has to be that soundtrack which had grown considerably from the preview version presented in the earlier release W.A.R. Preview. Once more looking at this release from a C64CD angle, Rob Hubbard has previously been established as having started to program in 1984 whilst the earliest Stoat & Tim releases were in 1985 so they presumably began learning around the same time or perhaps before. That places them squarely either within or prior to the author’s 1984/5 window but they apparently didn’t struggle to find appropriate resources or documentation despite the author’s claims to the contrary. One tune is missing from the set however, a hidden remix of the high score tune from previous Martech game Crazy Comets which can be accessed in the game itself by entering “GO 159256” into the high score table; this code was the command users had to issue on Compunet to visit Stoat & Tim’s area on the server – this extra tune can be found both in the High Voltage SID Collection or the Mean Team demo It’s War! which uses a rip of the game’s music, press 9 to hear the tune. This entry was posted in Meta Discussion, Programming and tagged C64, Code Notes, coding, demo, programming, Rob Hubbard, Stoat And Tim, W.A.R.. Bookmark the permalink.